Python 3.5/3.6+ support on Windows. Support for these versions was previously available in nightly builds due to changes in the compiler toolchain, but official wheels are now available. A new RecycleView widget replaces the old ListView. It is faster and more efficient, but with a simpler API. Graphics backend improvements including ANGLE support on Windows and a mock backend for headless Kivy. Several new Window options when using the SDL2 backend, for much improved cross-platform behaviour. There are also many other new features and bugfixes, spread across over 1500 commits from almost 100 different developers. Thanks to everyone who contributed! python-for-android has just gained support for a new webview app interface, an alternative to the existing SDL2 or Pygame backends. Under this mode of operation the app gui consists entirely of a browser window directed to open a webpage on localhost, and the Python backend can then run any web framework (I tested with Flask, but others like Bottle or even Django should work), serving this website and managing the app backend. This idea is not itself new; I think SL4A has supported a kind of webview interface for some time and certainly does so now, and we’ve previously seen users running web servers alongside Kivy. The difference to other projects is that apps can take advantage of python-for-android’s relatively extensive toolchain including python3.5 support, the ability to build popular libraries like numpy, support for multiple architectures, and access to the Android API via PyJNIus or Plyer rather than SL4A. 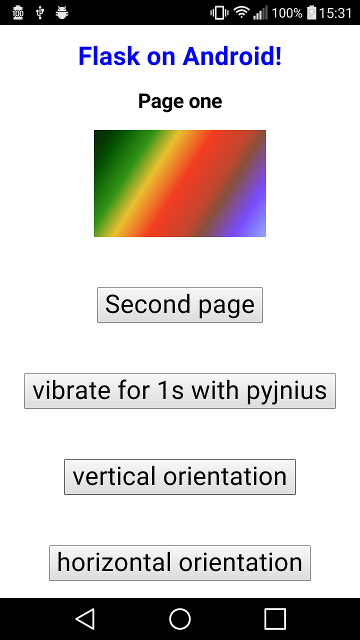 In the image of my testing app above, each of the vibration and orientation buttons sends a request to a Flask url that calls the Android API with PyJNIus to achieve the desired result. You can use the webview backend by adding --bootstrap=webview to your python-for-android command line (see the documentation for more details), or including webviewjni in your --requirements argument list. Note that this is incompatible with using SDL or Kivy because the webview bootstrap does not start or manage an OpenGL context. If for any reason you want to run a web server alongside a Kivy app, this is possible but you’ll need to use a different bootstrap and manage the webview yourself via PyJNIus from your Kivy code. You should also add your chosen web framework to the --requirements argument, or include it your app directory so that it will be imported locally. If there isn’t a recipe for it and it’s a pure Python module, make sure you also add its Python dependencies as these aren’t automatically included right now (letting pip resolve dependencies causes issues when they include compiled modules that must be built separately). python-for-android now includes a recipe for Flask that automatically installs its dependencies (jinja2, werkzeug, markupsafe, itsdangerous and click), so you only need to add flask to the requirements in that case. It turns out that very little hackery is necessary to make a webview type app work. The APK seems to need the INTERNET permission to use a WebView, but Android is very happy for the Python code to run a web server with no further problems. Making PyJNIus work required a little extra work, as it previously relied on the now-absent SDL to access a pointer to the current JNIEnv. This was fairly simple to fix by using only the relevant code from SDL2 - the important parts are only a small fraction of what SDL provides, as SDL has to worry about all the app input and output going via JNI. For now, python-for-android just patches PyJNIus before building it, but now that there are three different ways to get the JNIEnv on Android this will need addressing somehow in PyJNIus itself.